Q1. How and why does Conan Doyle present Baskerville Hall as a liminal space? Ans. 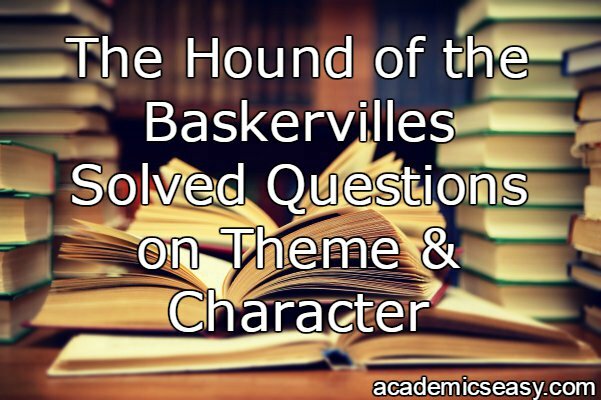 In contrast to “green squares of the fields” that are nearby, the lands on which Baskerville Hall is situated feature “a gray, melancholy hill, with a strange jagged summit, dim and vague… like some fantastic landscape in a dream”. Such liminal locations, or thresholds, are common in fantasy literature; readers may be somewhat more surprised to encounter the motif here in a work of detective fiction. Liminality, however, has its place in this genre, as well. Sir Charles’ murder has, after all, thrown the social order of the Baskerville family out of alignment; indeed, any crime is a dis-ordering of society. It is fully appropriate, then, that this disorientation would be reflected in Baskerville Hall’s status as a liminal location, between the worlds of justice and criminality, social order and social chaos. The legend of the ghostly Hound, in fact, only accentuates its liminality, since such spectral appearances are, in themselves, liminal beings. Q2. Briefly discuss an example of how and why Conan Doyle uses the weather in his novel as a thematic device. Ans. Weather features prominently at several points in the book. Watson, for instance, states that news of Selden’s escape completes “the grim suggestiveness of the barren waste, the chilling wind, and the darkling sky”. Conan Doyle comes close to indulging in what literary critics identify as the pathetic fallacy, the attribution of emotions or characteristics to the natural world. Watson does not quite do so, but without doubt the physical setting is here reflecting moral and psychological dimensions of the story. Selden is as “barren” of human sentiment as the moor is of vegetation; the murderer’s malignant heart is as “chilling” as any icy gale. Similarly, when Watson hears a crying woman late during his first night at the manor, he can only determine that the sound “could not have been far away and was certainly in the house”. Although we will learn the identity of the weeping woman in the next chapter, at this moment, it is almost as though Baskerville Hall itself is crying, mourning and keening for the loss of life, the loss of future that has occurred. Q3. How does Jack Stapleton’s first appearance prepare the readers for the revelation of his real involvement in the case at the novel’s end? Ans. Clearly, Jack thinks highly of himself when he indulges in some subtle boasting about his knowledge of the moor and the mire, he remarks how only “a very active man” and one with “wit” can reach the islands. Watson seems to have some uneasiness about Jack: the doctor wonders why “this highly educated man and this beautiful woman” have chosen “to live in such a place” as Grimpen, although he does not express any explicit doubts about their connection to Sir Charles’ death. Beryl certainly knows more than she is willing to share with Watson. Not only does she have “no ring of conviction in her words” when she professes happiness in Grimpen, but also she attempts, unsuccessfully, to retract her urgent warning to Watson, claiming only she “was distressed… when another member of the [Baskerville] family came down to live here… [and should therefore] be warned of the danger which he will run”. Beryl is in some respects a stock figure of Gothic tales, a mysterious woman with a secret who combines elements of such familiar archetypes as the madwoman or the persecuted maiden. Interestingly, Watson remarks upon her first appearance that she seems “a strange apparition upon a lonely moorland path”. The explicit comparison to a ghost not only resonates with descriptions of the spectral Baskerville hound, but further contributes to the strange, liminally-charaged atmosphere of Baskerville Hall and its environs. All of these details throw the reader slightly off balance, thus preparing us for the ultimate revelation that Stapleton is the criminal mastermind behind Sir Charles’ death.